It’s hard to imagine a less appropriate director for a gritty drama set in the wake of the London riots than Michael Caton-Jones. The veteran Scots filmmaker, best known for period romps like ‘Memphis Belle’ and ‘Rob Roy’, hasn’t made a feature film in almost a decade – hardly surprising, considering the unmitigated disaster that was 2006’s ‘Basic Instinct 2’. If ‘Urban Hymn’ is his bid for redemption, it’s pretty misguided. 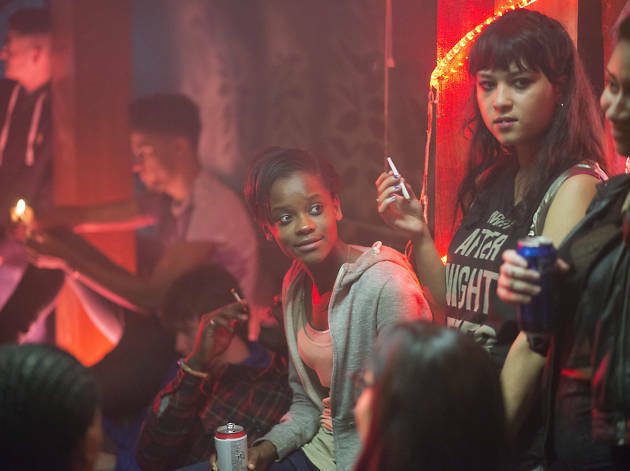 Teenage offender Jamie (Letitia Wright) is in a downward spiral. A resident at the Alpha House care home, she’s being led astray by her best friend Leanne (Isabella Laughland). But luckily, help is at hand in the form of care worker Kate (Shirley Henderson), who realises that all Jamie needs to get her life in order is a spot of positive reinforcement from the nice middle-class folks at her community choir. But will thug-life Leanne let her pal leave the mean streets behind? The crude good-girl/bad-girl dynamic between its young leads is just one of many crass elements in this woolly, well-meaning but fatally unconvincing melodrama. Wright gives a dignified performance, but she’s undone by the lazy dialogue and blunt, join-the-dots storytelling. Next time, how about the deprived girl from the mean streets has ambitions to be a scientist or a doctor? Amazing film. Not what you would expect. So many amazing moments captured so beautifully. Really enjoyed this film, gritty, believable and well casted. Don't let one mans review stop you from seeing it. Just because it's indie and low budget doesn't mean it deserves one star.